Configure Bamboo to send SMTP email (see below). Configure a plan to send SMTP email notifications about build results (see Configuring notifications for a plan and its jobs). Click Mail Server in the left navigation column (under 'Communication'). This will display the 'Mail Server Details' page (see screenshot below). The email address from which Bamboo notifications will be sent. Choose either SMTP or JNDI. See the Notes about JNDI below. The address of the email server that Bamboo will use to send notifications e.g. 'mail.myserver.com'. The login name of the account that Bamboo will use to login to the SMTP server. Depends on your application server, and on the location of the 'mail' resource within the JNDI tree you specify. E.g. 'java:comp/env/mail/BambooMailServer'. Type a test email address in the Test Recipient Address box. Click Test, and verify that a test email is received. Gmail.com uses TLS (SSL). A JNDI connector needs to be configured. Unfortunately Bamboo does not yet support JNDI with TLS. If the javax.mail-X.X.X.jar and javax.mail-api-X.X.X.jar files don't exist in the <Bamboo-Install> /lib directory, you must move the javax files installed at <Bamboo-Install>/atlassian-bamboo/WEB-INF/lib to <Bamboo-Install> /lib. If the javax.mail-X.X.X.jar and javax.mail-api-X.X.X.jar files already exists in the <Bamboo-Install> /lib directory, simply delete the javax files shipped with Bamboo in <Bamboo-Install>/atlassian-bamboo/WEB-INF/lib . 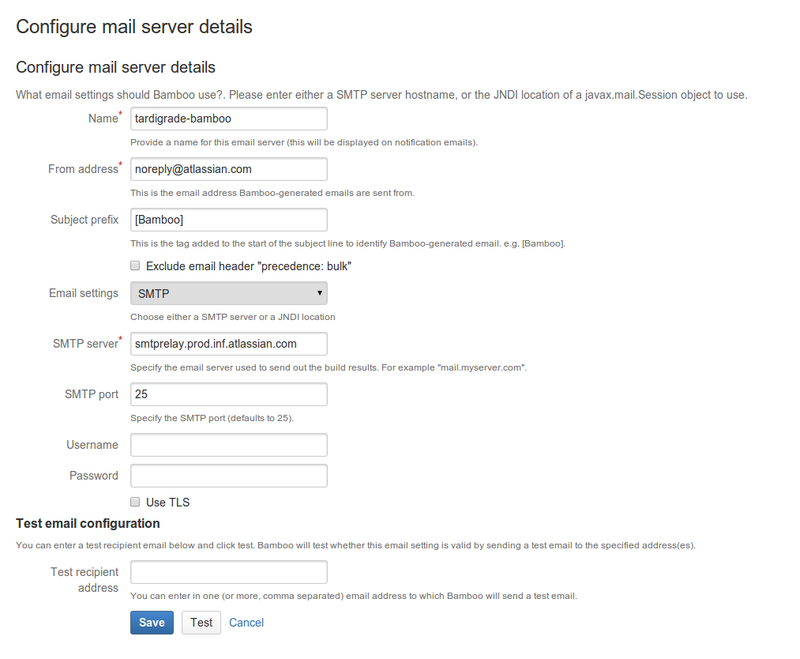 Configure Bamboo to use a JNDI Location of java:comp/env/mail/GmailSmtpServer. Note that the JNDI Location is case sensitive and must match the resource name specified in server.xml. Centralized management - mail details are configured in the same place as database details, and may be configured through your application server administration tools. Better security - mail details are not available to Bamboo administrators through the Bamboo interface, and aren't stored in Bamboo backup files. More SMTP options - e.g. SSL. If you want to use SMTP over SSL you will need to use JNDI.